The outgoing mayor called a Democratic candidate’s campaign racist. Here’s why he’s wrong. New York City Mayor Michael Bloomberg, like most Americans, doesn’t understand what racism is. Or perhaps he does and is purposefully pretending to be obtuse to score some political points. Either way, his remarks in a recent interview with New York magazine do little more than further confuse the public as to what racism entails by reinforcing a false narrative of equivalency. Well, no, no, I mean* he’s making an appeal using his family to gain support. I think it’s pretty obvious to anyone watching what he’s been doing. I do not think he himself is racist. It’s comparable to me pointing out I’m Jewish in attracting the Jewish vote. You tailor messages to your audiences and address issues you think your audience cares about. 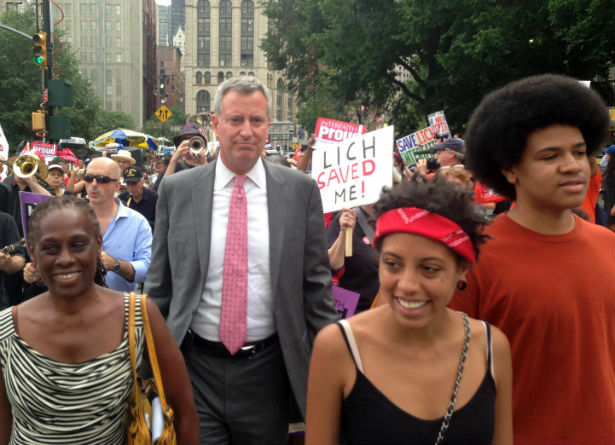 It’s true that de Blasio, like many other politicians, has featured his family in his campaign. What’s unique to de Blasio is that he is a white man who is married to a black woman and is the father of two biracial children. His son, Dante (and Dante’s huge Afro), have been featured in commercials that have been critical of stop-and-frisk, the police tactic made famous during Bloomberg’s tenure. Dante’s appearance has personalized de Blasio’s objection to a tactic that was deemed unconstitutional, but not before police stopped and frisked more black and brown young men than even live in the city. One hopes de Blasio would object to stop-and-frisk even if his son were not at risk of being a victim of this racist policy, but making an appeal to voters on a personal level, showing that you can relate to the real issues affecting everyday people, is politics 101. The definition of racism in public discourse has been so distorted that any mention of race is construed as racist, mostly by opportunistic right-wingers looking to deflect from their own racist beliefs. Any analysis of race and racism in America that does not account for the country’s white supremacist foundation is useless. Ultimately, racism is a system of oppression that has disproportionately benefited those classified as “white” and regards others as second-class citizens. For a policy/thought/action/statement to be racist, it has to reinforce that second-class status. Absent the power of doing so, we’re not talking about racism. Bigotry, perhaps, or personal hatred, but not racism. Racism needs power. It’s why Bloomberg’s stop-and-frisk is racist, and de Blasio’s pointing out that his son could be a victim of stop-and-frisk isn’t. One uses the power of the state to impose second-class citizenship on a group and justifies it by employing rhetoric that deems them inherently criminal and inferior; the other is a personal testimony of how that affects the lives of those who are targeted. This only becomes difficult to parse when we live in an America that is so afraid of its past, it assigns racism to the demons of its history, rather than acknowledging the smartest, bravest and kindest among the architects have also held deeply racist views and helped perpetuate this system of oppression. Those who regard themselves as “good” people cannot also believe themselves racist. And those who invest their own money in programs to aid black and Latino boys would never be found on the side of a racist police tactic. Yet, that’s exactly where Bloomberg finds himself. Deflect as he may, his term as mayor is characterized by one of the most far-reaching and racist public policies of this generation. I’m not saying Bloomberg is racist. But who cares? The racism of the policies he has stood behind have already done their damage.